When was the last time your ego took over? Maybe before the conversation with an employee who did something wrong. Was it when you were arguing which political party truly deserves to be in power, and why? How about that conversation that “mysteriously” led to you talking (ahem...bragging) about all the rich and successful people you know? At some point in time – we’ve all been there or at least we’ve known someone who has. The ego is the part of our subconsciousness that craves control. It makes us feel safe, important and valued - something every human being needs right from the time they’re born. The issue is when the egotistic voice starts to over emphasize our individual importance in the world. If your inner voice is constantly telling you that you are better and more valuable than the people around you, that’s your ego creeping in. We sometimes think the ego helps our self-identify but it might just be doing more damage. More importantly - it can hurt personal and professional relationships. Leaders need to have a sense of confidence that they know what they’re doing but when consumed with an overwhelming sense of self-worth, importance, and pride, they fail to inspire. 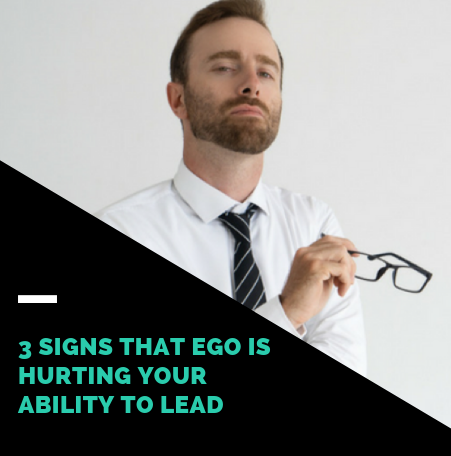 Their teams can become disengaged and disconnected, and in extreme situations - an ego-driven leader creates a toxic environment where staff try to sabotage that leader’s growth out of sheer frustration. Egotistical leaders fail see the bigger picture and for a business that’s looking to thrive long term, a leader like this can be devastating. If left unchecked, the ego can make the most intelligent individual seem like a complete jack-@#$. And no one likes to work for, or with one, regardless of how intellectually capable they are. No one. What Are The Warning Signs That Our Ego Is Calling The Shots? People who have an obsessive need to always be right are driven by ego, which will inevitably endanger both their personal and business relationships. Unfortunately, most people are unaware of their “I’m right” syndrome. If you hear your friends, colleagues, employees, or supervisors call you on it, don’t get defensive. Instead, think about what they’re saying, and why they’re saying it. Take a step back and consider all the facts. The moment you open your mind to other people’s opinions, suggestions, and solutions, you’ll see beyond your ego-induced judgment and criticism, to embrace a multitude of potential opportunities. It will not only make you a great leader, but a better person, as well. Examine this scenario between a leader, let’s call him Bob, and one of his team members, who we will call Kate. Kate had only been in the industry for a few years, and was looking for a leader and mentor. She hoped to learn from Bob and his impressive success in sales. However, instead of offering her valuable support, Bob mostly bragged about the praise he received when starting out as a “young-gun” in Kate’s role. He was a serial name dropper, always reminding his team of his accomplishments and accolades. On one project, Kate stayed late, working countless hours. In spite of this, she received little appreciation, only getting feedback on her mistakes. Regardless, her work and effort shown through on the project. When the CEO asked to meet with key members of the project, Bob told her and the others they “didn’t need to be there,” even picking a time when the team wasn’t available. Being a ‘Bob’ will only lead to resentment and alienation from your team over time. Try focusing on boosting them up, instead of stepping on them to gain a brief moment of glory. Every leader must understand that life is unpredictable and that you can’t control everything, no matter the level of planning. The stress and emotional discomfort inherently will result in intense vibes, causing entire teams to start feeling tense, leading to their distress and loss of productivity. Try to focus on courage instead of fear, and practice letting go, possibly through meditation. The ego won’t ever go away, as it is one of the layers of our being and psyche, but it can be tamed by noticing when it’s calling the shots. It’s possible to evolve, becoming more aware of the ego, and therefore more capable of shutting it down if it won’t serve us. A little ego doesn’t necessarily have to be a bad thing. The ego prevents us from being pushed around, two-timed, or allowing others to use our kind heartedness for their benefit. As long as you know how to channel your ego, it won’t hurt your perception and decision making. Instead, you’ll be the type of emotionally intelligent leader everyone wants around. Older PostNike Just Schooled Us All!